The Real MacKenzie: Brazil's Olympics! Take a venture through the canyons and hills of my mind. "No one is happier than Brazil's people. But maybe because we were a colony for such a long time, we always had this sense of inferiority, of not being important. We always thought that we couldn't do what the others could." "We know the IOC decision has increased our responsibility. We know what we need to do. The word from now on is work, work and work." If you were hiding in a cave for the last couple of days, you would have still heard about it. The news that Rio de Janeiro was picked to be the host of the Summer Olympic Games in 2016 had that much reverberation; that much power. It wasn’t like Vancouver getting the Winter Games. When Vancouver won, there was a fair bit of opposition to the idea, particularly here in town. Across Canada, it was somewhat of a hiccup; a Toronto businessman seeing the headlines on the front page of the Globe and Mail and then remembering he had to be in the office for a meeting in half an hour. A fellow turns to another fellow in a bar and says, between sips; “Hey, didya hear Vancouver got the Winter Games?” And his friend would mutter something about how Canada better get the gold medal in hockey this time around. And in the rest of the world? It didn’t matter all that much who got the Winter Games. Just a little burp and then people went onwards. But Rio? Summer Olympics? Man, it was all over the news. Facebook was abuzz, Twitter was hyped. It wasn’t just Brazilians who were happy. Many around the world, admittedly, were pleased to see the United States not win something for a change. After all, the knock against the United States (apart from the ubiquitous war on terror and the everlasting Bush hangover) was that they already had the Olympics not long ago, in 1996, and that Olympics – in Atlanta – is considered one of the less memorable summer Games in recent memory. What’s more, the United States had more important issues to take care of in their own backyard than to worry about expensive Olympic tripe. Rio, on the other hand, had plenty of backers. Even Americans were pulling for Rio, such as this one journalist who was almost embarrassed at his joy after hearing the news. On to my point: I’ve had several discussions with my Brazilian partner about what all this means for her country. 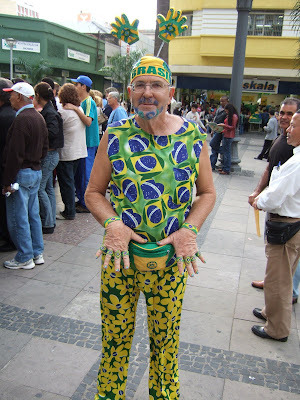 When I remarked that perhaps Brazil felt like they were finally being recognized by the world, and that there is a small insecurity in its people (as President Lula said yesterday in his “acceptance” speech) that craved to be recognized by the world’s populace, my partner responded with a great Brazilian pride. Sure, for some people, there is the need to be recognized, she said. Sure, there are others who say this is a great opportunity for Brazil to grow, and it’ll bring jobs to Brazil, it’ll be great for the country’s economy. Corporations in Brazil will salivate at the opportunity. And so on and so forth. But, she said, the most important thing about the Games being in Brazil is this: Pride and honour. The average Brazilian, the one who gets up, has a shave, gets on the bus for his long commute to his joe job, and takes care of his kids and his family, already has an immense sense of pride in being Brazilian. And getting the Summer Olympics is just a deep, deep honour for that Brazilian. This led to a discussion on pride. Brazil, as many will learn when they look into the country or when they visit, is a very proud, patriotic nation. It’s a lot like the United States, but without the unabashed, holier-than-thou arrogance. I, personally, was very impressed with it. Brazil is an incredibly diverse nation, with all kinds of blood racing through its veins. There are Africans, Italians, Japanese, Portuguese, Spanish, Tupi, Guarani and many more kinds of people all mixed up into one huge soup. And it’s all collectively Brazilian. I’ve spoken with people from Brazil who have a Japanese background – and they look Japanese to me – but they consider themselves Brazilian first and foremost. It’s a country unified in such a way that it should invite envy from other New World – sorry, North and South American – countries which have a similar diversity in its mixture. That especially includes Canada, where we’re so tremendously disassociated with each other that we’re dependent on our love for puck and disdain for America in order to retain our so-called “Canadianness”. We, in Canada, and we, in the rest of the world, also stand to learn a lot from Brazil in the way it’s progressed as a country. Here’s our chance to really learn. Just watch. Brazil has two glorious opportunities to show itself on the world stage – the World Cup in 2014 and the Summer Olympics in 2016. As aware as I am of the possible financial fuckup of other Olympics (Vancouver, with its ever-escalating security budget, and Russia, with its recent tripling of its Olympic finances) I’m very hopeful, and even optimistic, that Brazil will not do the same. They do have a lot going against them, with crime, favelas, corruption, yes, but they’ve got a lot going for them too; creativity, fresh outlook, booming economy, vibrant, educated, patriotic people, and above all, a very healthy multicultural society. They also have something that I deeply adore: passion. Oh yes, passion. Hell, President Lula even cried during his acceptance speech. Now, I’m not a flag-waver for the Olympics – I believe just as much as the next guy that it’s all about bloating of corporate profits, a huge party for the wealthy – but awarding the Olympics to Brazil makes me feel very optimistic. First, the International Olympic Committee is recognizing Brazil as an emerging presence. Second, Brazil now has the opportunity to show the world that peaceful co-existence between different cultures, in a stable democratic country, without an arrogant, self-serving Old World folk is very well possible. Third, Brazil has a fresh approach to how things can be done; notable examples include banning billboards and all exterior advertising in Sao Paulo and turning to ethanol as a source of fuel long before it became trendy. We arrogant, tired, overly developed countries would do well to look at Brazil and the way it does things. And now we have a chance to look. Brazil has been handed the torch. Be it yours to hold it high. Enfim... o verao! Praias, sol, fogueiras...fogueira??? Not here. A man who is alive again, beguiled again, a wimpering, simpering child again. He is bewitched, baffled and bewildered by it all.